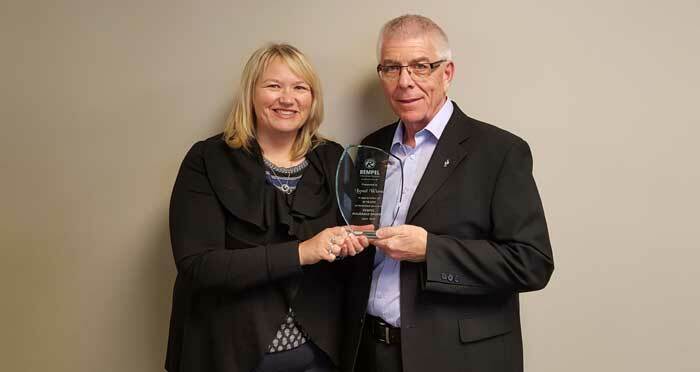 In April 2016 Lionel Wiens reached the 20 year milestone with Rempel Insurance Brokers. We are excited to honor Lionel Wiens with a plaque of appreciation for his 20 years of service with us. Lynn Rempel presented Lionel with a plaque to honor his dedication. Lionel started his career at Rempel Insurance back in 1996 working as an account manger in the farming insurance department and contiued doing so till February 28, 2017. During the summer of 1989 I was approached by my friend and former co-worker Ross Leatherdale of Leatherdale Agencies in Winkler. He asked if I had any interest in buying a book of business that included many Lowe Farm area clients. He had purchased this book from a local “captive agent” several years prior and his retention of these accounts was less than expected. Ross was convinced these clients needed a local representative. He offered to sponsor me with Manitoba Mennonite Mutual Insurance Co. (MMM) in Steinbach. I had been grain farming for 12 years at and with winter months not being very busy, I was looking for something to fill my spare time and provide some extra cash flow. I enrolled in the Fundamentals of Insurance program and studied by correspondence. By mid October I felt ready to write the exam. Having not written and exam for years, I was somewhat anxious when I made the appointment and was advised that a mark of 75% was required to pass; however I passed on the first attempt. The contract with MMM Insurance was signed effective January 1, 1990. On December 29, 1989 I became the representative for 33 Leatherdale Agencies account files. I was officially in business and really enjoyed the interaction with clients and company people. In 1995 MMM Insurance ran into financial difficulties and eventually a decision was made to merge with Red River Mutual. I approached Red River Mutual and discussed obtaining a contract with them and this was declined. The days of the “captive agent” were numbered, so I wondered what would happen to my book of business and clients. It did not take long before I was approached by 2 insurance brokers, Henry Friesen of Friesen Agencies in Winkler and Dale Rempel of Rempel Insurance Brokers in Morris. Negotiations continued for several months and effective January 1, 1996 my book of business was acquired by Rempel Insurance Brokers Ltd in Morris. As Rempel Insurance Brokers already had a MMM contract, this option was best suited to my clients; allowing for the transition to another insurance carrier on client renewal dates. Henry did not have a MMM contract so the renewal date for all my clients would have been January 1, 1996. The agreement with Dale also provided the opportunity to continue representing my clients and actively look for new clients. With access to a number of markets and the support of the team at Rempel Insurance I was able to grow my book every year. In 2004, after farming grains and oilseeds for 28 years, my wife Lorraine and I were considering our options for the farm and renting it out was part of the discussion. In a very informal discussion with Dale I mentioned I was looking for a change. Dale’s mind was always working so it did not take long until he requested we sit down and discuss a plan. He offered me the position of account manager; continuing to represent my current clients and prospect for new business. In addition, I would be a service partner for Andy Anderson’s accounts. This would be a significant change, going from being self employed and quite independent, to having set hours, an office presence and reporting to a supervisor! After some serious consideration, on May 2, 2005 I accepted the offer and began working at the Rempel Insurance Brokers office. Initially when Dale asked how long I wanted to work in this position I told him 3 to 5 years; when I retire on December 31, 2016 it will be 11.5 years! I have been a part of the Rempel Insurance team for 21 years and in April of 2016 I was recognized for achieving the 20 years of service milestone. Rempel Insurance Brokers Ltd provide many opportunities for personal and professional growth. I sincerely appreciate the support and encouragement I have received from so many people over the 26 years in this profession. I am truly humbled with the trust and confidence the policy holders placed in me! I have no regrets on this journey in the insurance profession and being part of a brokerage that strives for excellence in everything they do!